Run during the school holidays, Summer Camps are a great week of surfing from 9am to 12pm, Monday to Friday. There are two age groups: 9-12yrs and 12-16yrs. We spend as much time as possible surfing while they also learn how to read the tides, wind and swell direction, water safety, surf etiquette and how to do a surf report. 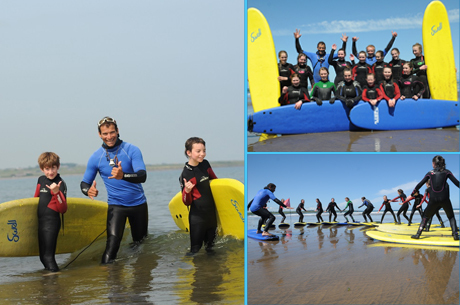 After a fun week surfing, their confidence and group interaction has grown, making the Summer Camps a very popular option. Wetsuits and surf boards are provided. Spaces are limited so it is a good idea to book. > What to Bring: Just swim gear and towel. We provide wet suits and all surf gear. > How to Book: You can Book Online or book by phone: 087 2870817. > What do they Learn: Basics of surﬁng, how to read the tides, water safety and surf etiquette and surf report in a fun environment! > Important information: It is important to book as there are limited places each week. Changing rooms are available for before and after the camp. *All instructors are fully qualiﬁed and will always be in the water. The ratio of instructors to students is 1 : 8 with more instructors added if required.